Even if we love animals not all of us have the perfect situation for dogs, cats, and other domesticated creatures that require loads of time and attention. Fortunately, there are animals out there who can keep us company while needing much less of our energy to keep them happy. Different fish vary in their needs but bettas are known to be low maintenance while brightening our homes with their colorful fins. Betta fish do well without a companion and, in fact, must be kept alone. They only require minimal attention from you; what really matters is their home. Although bettas are small you should provide them with at least a two-gallon tank. Avoid the small decorative sectional habitats that allow you to keep two or more bettas – these are much too small. After selecting your tank, purchase the appropriate equipment. Bettas are tropical fish and can use a water heater but it’s not necessary if your home is climate controlled. Choosing the suitable accoutrements for your fish tank is also important. Bettas have long, diaphanous fins which are easily damaged. To minimize injury to their fins, choose soft plastic plants and polished, rounded stones or glass as ornaments. They should have a “house” or a cave to hide in but double check for sharp or unfinished edges and surfaces. While your bettas don’t require a lot of attention, they do require a clean environment. You should expect to clean your tank periodically or buy equipment that will lengthen the time between cleanings. Hamsters don’t have extravagant needs but they should have a little bit more TLC than your average fish. Like betta fish, hamsters like to live alone. You don’t have to buy one from a pet-supply store either – animal shelters have hamsters in abundance all waiting to be adopted. One advantage they have over fish is that they are cute, cuddly, and entertaining with their antics. Again, their habitat is the most important aspect in their care. A nice, large cage with toys and a wheel are necessary. They like to explore so a cage with tunnels and crawl-spaces will increase their enjoyment. Luckily, any store carries ready-made supplies for hamsters. Bedding, food, and toys are prepackaged and only need to be doled out when needed. 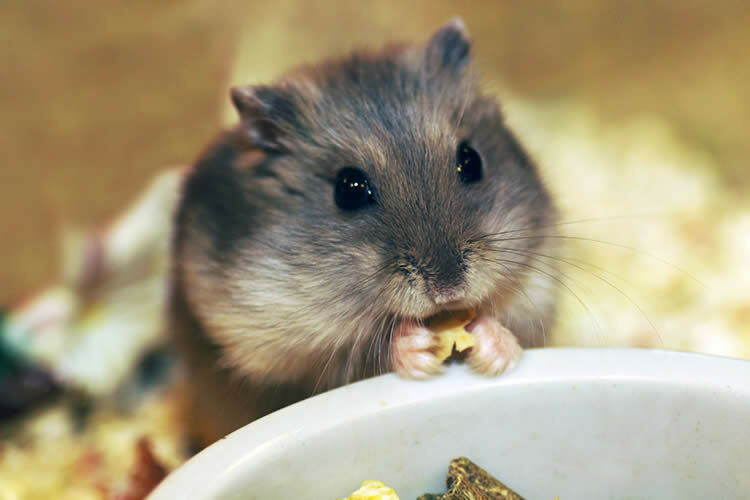 Be aware that many unhealthy hamster products are sold. Choose high-quality fluffy bedding that won’t cause respiratory problems. Hamsters love to burrow and they can inhale harmful dust and particles from inferior bedding. Similarly, not all hamster food is equal. Do your homework to make sure the food you choose is of superior quality. Rodents love fresh fruits and vegetables too so giving them a healthy snack from your fridge is a small way to make them extremely happy. An exercise ball is essential for a hamster. Make sure your little guy isn’t cramped or dwarfed by the ball – it must be size-appropriate. You’ll notice that it will fast be his favorite toy but don’t keep him in the ball longer than thirty minutes to an hour. Most of the time spent on your betta or hamster will be the initial setup. Buying them supplies, setting up their habitat, and making sure they are comfortable will be where the most time is spent. Many of the supplies are sold in bulk and will last you at least a few weeks. Like all animals, fish and hamsters eat, defecate, and produce bacteria. If you want to spend no time cleaning, then there isn’t a pet on this earth that is right for you. If you can handle spending 30 minutes a week being your betta’s or hamster’s housekeeper, then you most certainly will be rewarded tenfold with the delight they will bring you. The Hamster House: Do hamsters Get Lonely?